Owain’s public image is that of the revolutionary warrior prince. The public are far less conscious of his formidable skills as statesman and diplomat. France and England had been rivals and foes for centuries and in 1337 the Hundred Years War started. In his revolt against the repression of the English crown Owain sought support from France, who had established links with Scotland and Ireland. Owain Lawgoch (Owain of the Red Hand), a great nephew of Llywelyn the Last, spent most of his life in exile in France as an officer in the French army. His dynastic claims made him a grave threat to the English throne especially when, in 1372, the French king gave him a fleet and an army to invade Wales. The expedition was called off. He was assassinated in 1378 by an English spy, but his French service may have been influential when Glyndwr was to call for assistance from France later. Henry IV was heavily involved in expensive campaigns in Scotland and Ireland, and his right to the English throne was questioned. In 1401 a Welsh knight, Dafydd ab Ifan Goch, was sent as an emissary to the king of Scotland on behalf of Glyndwr. In 1403-4 the French squadron of Jean d’Espagne had worked with the Welsh and Owain sent his brother-in-law John Hanmer, and his chancellor Gruffudd Young to France. A treaty was concluded on July 14th 1404. A French force left Brest on July 22nd, 1405 with 140 ships carrying 800 men-at-arms, 600 crossbowmen, and 1,200 lightly armed troops, and reached Milford Haven early in August. They joined Owain’s men on a march through south Wales, into England, and reached Woodbury Hill within 8 miles of Worcester. In November, however, a large body of French knights returned to France, and early in 1406 the rest of the French went home. Only feeble attempts were made afterwards to provide replacements for them and after this there were to be no more combined military operations to speak of. On March 31st. 1406 Owain Glyndwr sent a letter in Latin to king Charles VI of France at the synod of the Welsh Church at Pennal. Its main interest is that it highlights Owain’s ambitions for Wales as an independent country. Click here to see the full text of the letter. He wrote to seek the king’s support for his campaign to rid Wales of oppressive English rule (there were severe discriminatory laws favouring the English over the Welsh in Wales). In return for French support Owain was prepared to recognise Benedict XIII of Avignon as Pope (in place of Pope Innocent VII in Rome, whom the English recognised). Benedict was expected to support more suitable ecclesiastical appointments in Wales. Hereford, Worcester, Coventry and Lichfield, and in so doing return to the arrangement that applied at an earlier period in Britain’s history. Income from monasteries and their lands would be retained in Wales. His vision included the establishment of two universities - one for north Wales and the other for south Wales (there were only 22 universities in the whole of Europe at the time). 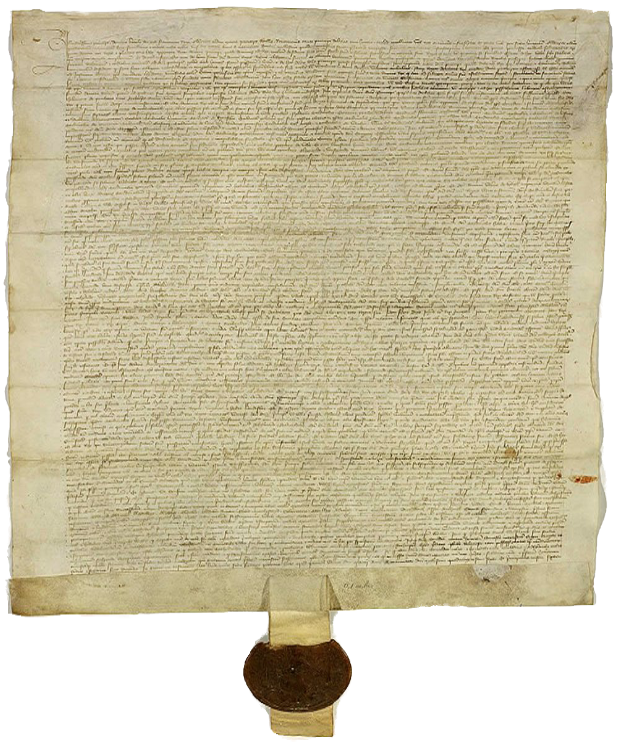 The original letter is held at the Archives Nationales in Paris but facsimile copies of the letter were presented to the following: St Peter ad Vincula Church, Pennal; The Owain Glyndwr Centre, Machynlleth; the National Library of Wales; Glyndwr University; National Museum of Wales; National Assembly of Wales. These exact facsimile copies on parchment, prepared by the staff of the National Library of Wales, should be seen to be appreciated. The staff used specialist-ageing techniques and the seal of Glyndwr was recreated from moulds of the original seal.